To inspire women to participate and gain skills in mountain biking by providing rides and resources that are supportive, social, fun and confidence building. Girls Rock is an informal women's mountain biking group. It's not a club or team. There is no membership fee or initiation. You don't have to join or commit to anything. Just show up! We host rides organized by rider level/ability. Beginners to advanced and everyone in between can join. 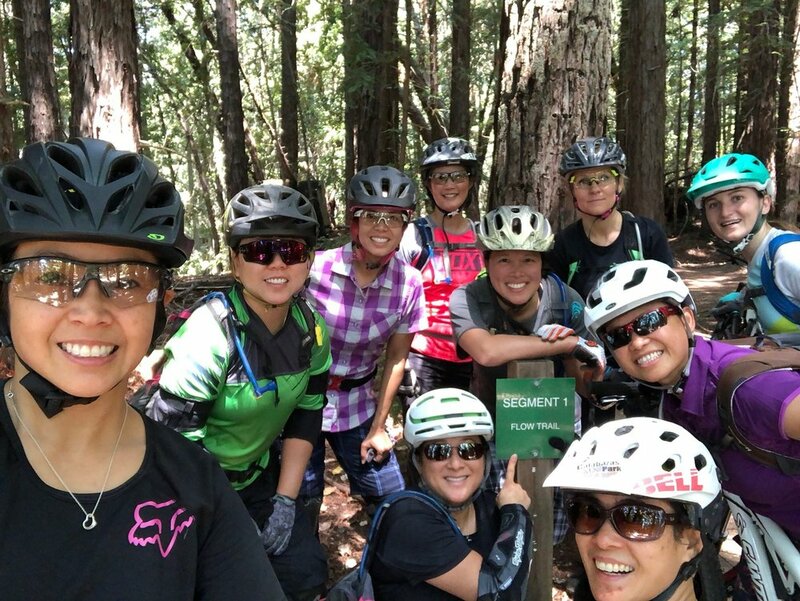 We offer opportunities to connect with other female riders in a casual, friendly environment. We are based in Santa Cruz, CA, where our rides often meet. It all started in the parking lot near Santa Cruz's Emma McCrary trailhead in spring 2014. Founder Jessica Klodnicki spotted a fellow Dirt Series camper Juliann Klein. Thanks to Juliann's love of purple, Jessica immediately recognized her from camp. Of course, Juliann wasn't hard to miss ... purple handlebars, purple pedals, purple shorts and helmet! That day, Jessica and Juliann rode together, and they collected a few more women along the way. It gave them the idea that they might rally more women to ride together. Purple passion ... It led to Girls Rock and fueled the design of this website, created by Juliann Klein, now the official Girls Rock Creative Goddess! We had four girls show up to the first ride. The next month, it was 12. Then 12 became 20. By ride #4, we had named ourselves Girls Rock. With each ride, friends told their friends, and we collected more women riders on the trail. By ride # five, our "Halloweeny ride," we were legit. Lisette, from the Juliana Bicycles brand, helped make us feel pro when she handed out our first swag, water bottles. Local mountain bike legend and Juliana namesake Juli Furtado even rode with us. Then Alexis, one of our regular riders, suggested linking up with local bike brand Ibis Cycles to host one of our rides. The Ibis crew were amazing – they had free demos, great swag and world-renowned pro rider Anne-Caroline Chausson showed up. Women came from San Jose, the Peninsula, the East Bay and Marin. More than 70 women were there that November day! Then, all these fabulous women - too many to name - pitched in to help lead rides and make connections. Next thing we knew, we were working with local bike shops, mountain biking coaches and industry brands. It was amazing how many people and companies wanted to donate their time and resources to make these monthly women's rides happen. Through this, we have met an amazing group of women committed to the sport of mountain biking. We are at a tipping point of a movement. The fact that women show up in greater and greater numbers to ride bikes has convinced us of the desire for a community of women mountain bikers. We can't be sure where this will lead, but we are excited to help fan the flames.